Cuphead turns players into perfectionists. The long-awaited hand-drawn action game is full of cartoony boss battles demand enough precision and focus that even a single hit of damage feels unacceptable. Playing Cuphead is like a stage performance; every mistake is embarrassing, but the curtain call of each defeated boss is like nothing else. The game looks like an old cartoon from the early 20th century and has a simple story to go with it. It features a small anthropomorphic cup and his mug buddy as they fight a horde of villains in order to avoid having their souls collected by the devil. Each fight plays out like an extended version of blasty action games like the iconic side-scroller Contra or the famously-tough Ikaruga. The game’s multi-phase bosses fill the screen with fire, smash the scenery with wrecking balls, and dotting the skies with a hail of bullets. Throughout it all, Cuphead and his pal Mugman must shoot their way to victory and collect souls for the devil lest he take their own. Cuphead, developed by StudioMDHR, was announced in 2010 and has drawn eyes for its graphics while generating animated debate about its difficulty. It is true that the game’s various boss encounters often provide a challenge, but they rarely feel unfair. Cuphead is mostly about pattern recognition and reading your opponent. Bosses start with simple attacks before ramping up their ferocity as their health is depleted. In their final throes they may summon extra minions or they may start a new pattern of attacks that requires intense concentration to dodge. All of this provides a lovely challenge that turns each victory into an intoxicating drug. You will die plenty in the game. I struggled for an hour with one boss, but victory seldom feels unattainable and the game’s ramp of challenges is mostly smooth. Things get rougher in the final segment, which includes a lengthy boss rush. The good news is that if things ever feel too difficult, there’s always the option to play co-operatively with another player. Boss fights only last two or three minutes but the technical precision required to find victory is intense. As you become more accustomed to enemies, you begin to see the flaws in your performance. You’ll notice that the giant fish monster’s bubble attacks circle in alternative rotations that you were ignoring. You’ll realise you missed a weak spot on the mad doctor’s robot. You’ll realise you should have been switching weapons and fared better as a result. If you’re a bit cheeky, you might even find a spot to stand where you’ll always avoid a major attack. Health is precious in this game. Bosses require hundreds of hits to die, but you’ll expire in just a few. When you die, a percentage bar shows you just how close you were to victory; there were a few times I was just moments away from victory if not for stupid mistakes early on. This makes it intolerable to lose health early in a boss fight. Not only does it rob you of precious hit points, but taking damage feels like a personal shame. There were many times I restarted battles immediately because I mistimed a jump or moved a few pixels too close to a boss and took avoidable damage. The game wants perfection and I played into the early morning hours until I delivered. 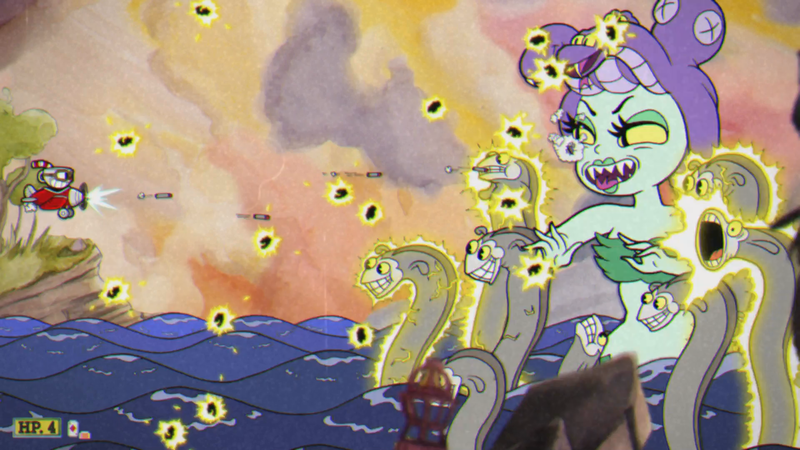 Cuphead is tough, but it is also generous in how much say players are given in how they’ll fare. The game provides many options for customising your playstyle. Cuphead can equip different attacks such as a wide but close ranged spread of bullets or a lobbed attack that is slow but powerful. Players can also purchase and equip various charms that add extra health or grant invincibility while dashing also equalise the playing field. A small portion of the game involves running through levels fighting enemies, basic side-scroller stuff. Climb up a tree of angry birds, blast through the wacky carnival. In those sections, Cuphead bends to the player’s will, letting you choose a rhythm and cadence that suits your playstyle and customisation choices. This is true for many of the game’s boss fights as well. But two boss fights that involve jumping from platform to platform painfully put players at the mercy of the developer’s rules and rhythms. In these sections, platform patterns sometimes seem random, making it all too easy to feel a loss of control and fall into a pit that seemingly couldn’t be avoided. Playing the game and nailing all your movements can feel like putting on a concert. You run and you shoot and you very much must parry. That last one is key. By batting away the projectiles or enemies, players can nullify damage while also launching Cuphead to new heights. Learning to use this mechanic is critical to surviving larger attacks or finding enough space to dodge. When it all combines, Cuphead feels like a raucous piece of orchestration with each movement, parry, and special attack a notable punctuation. Weaving these actions together isn’t always about victory, it’s about style. Succeed in the task and you’ve created something wonderful. A well executed boss fight is a thing of beauty you want to share with the world. Of course, the game is also gorgeous to look at. Cuphead takes up a hand-drawn art style evocative of early Disney or Max Fleischer cartoons and is simply delightful to watch. It can occasionally get overwhelming to keep track of the action but every single frame of Cuphead feels like a loving tribute to the bouncy days of Steamboat Willie and Felix the Cat. The art is complemented by catchy music full of plonky piano claps and boisterous brass. It’s hard to get frustrated at the game’s tougher moments when everything on screen brims with personality. Cuphead was originally presented in preview events as a game full of boss battles, with little to play between them. That changed as the game was under development. The finished work has small platforming levels to rush through and locations to clear but they never manage to form a cohesive connective tissues between the boss battles. Occasionally, they will add twists such as changing gravity but these levels mostly feel like gimmicks. Without the added tension of a relentless battle, these flourishes seem misplaced. They’re pretty, but they’re filler and the game would have been stronger, if more brief, without them. It seems that the developers know how disposable these levels are. They let you skip them, though doing so might mean losing out on extra coins to purchase upgrades. The levels dazzle in the moment before fading to the background. Cuphead feels a bit like a good magic trick. The experience is brief and so artistically impressive that it’s hard to believe it’s happening before your eyes. The game has one of the most memorable art styles in years and turns every moment into a picture-perfect display of cartoon merriment. But this is more than just an eye-catching game. Cuphead is all about the big fights and the feeling you get from winning them. It’s delightful and fun and worth the effort it’ll take to clear.